The Carnival Elation has a waiting list for the first International Cougar Cruise. (CNN) -- It's a trip that would make Demi Moore and Ashton Kutcher blush. On Friday, the Carnival cruise ship Elation, sponsored by the world's largest nonprofit singles travel group, will make history by hosting the world's first International Cougar Cruise, and we don't mean the animal. Defined by the Urban Dictionary, a cougar is "an older woman who frequents clubs in order to score with a much younger man." It can be anyone from "an overly surgically altered wind tunnel victim, to an absolute sad and bloated old horn-meister." "A cougar is generally known as a woman over 40 who likes to date younger men, but theoretically any woman who dates younger men is a cougar," said Rich Gosse, who came up with the cougar cruise idea. The ship, which sets sail from San Diego, California, to Ensenada, Mexico, for three nights, is booked for 300 guests and even has a waiting list. The ship has three swimming pools, a seven-deck-high atrium, bar and grill, a Moroccan-inspired Casablanca Casino and a lounge that features stage shows, according to Ann Thomas, owner of the Singles Travel Company and organizer of the Cougar Cruise. After making port in Ensenada, the cruise offers extracurricular activities like horseback riding, ATVing and other outdoor excursions. 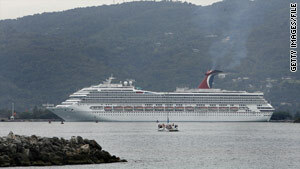 "There's at least four or five options a day for people to get together on the cruise. We're doing lots of activities; dancing, dining, Jacuzzi parties, karaoke for two hours. And starting at $125 a ticket, it's a great price," Thomas said. "I've had to hire two more people part-time just to pick up the phones," she said. "I've never seen a response quite like this." Thomas admits that she was hesitant to sign on to the idea but is glad she did. "We have people flying in from Italy and Denmark. My associates have been booking from France, Canada. It's fascinating," Thomas said. Gosse, who has been hosting singles events for more than 30 years, said he got the idea after hosting a cougar convention in Palo Alto, California. "We had to turn away hundreds of people," Gosse said. "Then we did one in Beverly Hills and had a massive crowd down there, so I thought, maybe we should do a cougar cruise. I didn't think anyone would want to go. Needless to say, the phone is ringing off the hook." These cougars may as well be an endangered species compared with those hunting them on this cruise. "The basic problem is, we have is too many cubs," Gosse said. "We usually have too many women and not enough guys, but there's been a paradigm shift in recent years, so now the cubs are more excited about it than the cougars." A "cub" is someone in their 20s or early 30s who likes to date older women, according to Gosse. For years, he says, it's been socially acceptable for older men to date younger women. But in recent years, a phenomenon sparked by celebrities like Kutcher, baseball player Alex Rodriguez (who is said to have dated pop star Madonna) and others has led a new generation of younger men on the prowl for more experienced partners. There is even an ABC sitcom called "Cougar Town" that glamorizes the sexual escapades of a 40-something divorcee on a search for self-discovery by dating younger men. "Tim Robbins [and] Susan Sarandon was the first high-profile cougar-cub relationship," Gosse said of the actors, who have been together since the late 1980s. "Now we're seeing a paradigm shift where these younger guys are actively looking for older women." "If you look at the demographics, the only logical way for people to get their needs met is for younger men to date older women," he said. According to the U.S. Census Bureau, for every 100 single women in their 20s in America, there are 118 single men in their 20s. The reason, Gosse said, is that young women are dating older guys. "When you're single, you always wish the person meets someone they want to be with. If this is something they want, then I wish them well," Thomas said.